In several European cultures, the main meal of Christmas occurs on Christmas Eve. Ukrainians, Poles, Italians and Portuguese, among others, mark the eve of Christ’s birth with a traditional meatless feast that emphasizes family and food. Many of the foods eaten at these dinners are unique, and the culinary and ethnic traditions can be centuries old. In days past, such meals conformed to Catholic Church edicts that called for abstaining from meat on the eve of religious feasts such as Christmas. Although the abstinence is longer required, some people continue with meatless traditions, primarily making fish the focus. Italian-American celebrity chef Lidia Bastianich has explained the strong tie immigrants have to such practices. In this way, Polish-American Catholics celebrate Wigilia on Christmas Eve. It’s one of the strongest links we have to our Polish roots. Part of the meal includes pickled herring, and in the home country, carp would be the main dish, as it is abundant there. But in Arizona, where much of my family lives, we never serve carp for Christmas Eve. It’s too difficult to get. So, our main Wigilia course is always varied; sometimes it’s grilled salmon dressed in a marinade, other times it’s fried white fish. One year, my brother-in-law made swordfish steamed in banana leaves. This year, I’ll be making Wigilia for our family, and after reading a bit about the Italian Christmas Eve Feast of the Seven Fishes, also a meatless meal, I’ve decided to go a bit Italian with the main course. One recipe from food writer and photographer Carla Capalbo drew my attention for its simple ingredients and preparation and its festive look. I’ll be making an adapted version of her Baked Cod with Garlic Mayonnaise for our Christmas Eve table. It will be my homage to immigrant chefs worldwide, to those that continue to spread the recipes of family and friends, to those that continue to draw together faith traditions and food. Make the mayonnaise. Mash the garlic cloves into a paste in a mortar or small bowl. Beat in the egg yolks, mustard and lemon juice. Add the oil in a thin stream while beating vigorously with a wire whisk. The mayonnaise should be thick and smooth. Season with a pinch of salt and a few grinds of pepper. Cover and keep cool. Preheat the oven to 400 F. Place anchovies and parsley on a cutting board and mince them together. In a small bowl mix the minced anchovies and parsley with three tablespoons of oil and a few turns of ground black pepper. Stir into a paste. 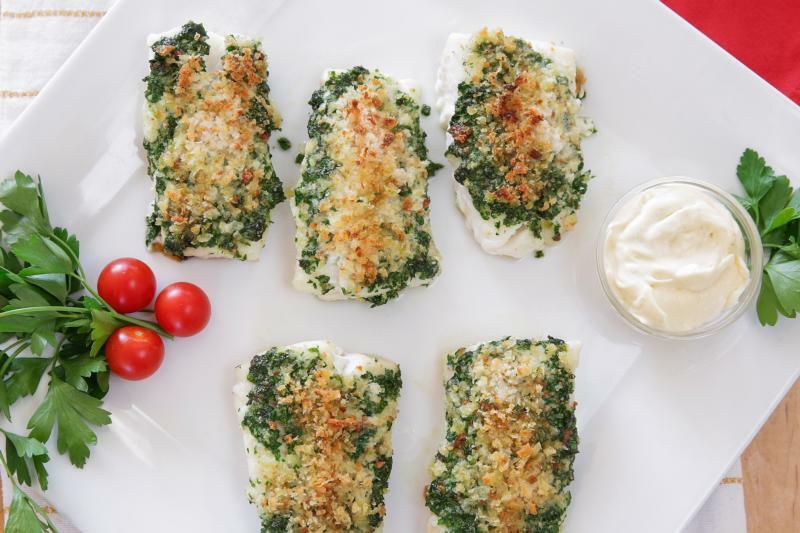 Place the cod fillets in one layer in an oiled baking dish. Spread the anchovy-parsley paste on top of the fillets. Sprinkle them with the breadcrumbs and then the remaining oil. Bake for 20-25 minutes, or until the breadcrumbs are golden. Serve hot with the garlic mayonnaise. Recipe adapted from “The Italian Cooking Encyclopedia” by Carla Capalbo, et al. PREVIOUS: At Christmas, take heart! God is with us!